A Punk, A Camera, and An Empty Stomach | Every Second Waiting is a Second Wasted. With all of the advances of today’s technology, manufacturers continue to push the boundaries of smart devices for consumers to use in their daily lives. Think about the timeline of time, for example. People started carrying pocket watches because they could not bring a wall clock with them on the go. Next, Peter Henlein invented the watch so people could see the time on their wrists instead of having to pull out the pocket watch. Centuries later, cell phones allowed consumers to once again have time in their pockets. From there, we arrive at today’s wearable technology; specifically, fitness trackers and smartwatches. Like cell phones, wearable gadgets come in all sorts of flavors, shapes, and sizes, and each consumer demands different specifications. One consumer may need a basic gadget. Another consumer may want every feature available to wearable gadgets. For the most part, when it comes to consumer electronics such as cell phones and wearable gadgets, you get what you pay for. For that reason, in 2017 when I decided to acquire a smartwatch for myself, I looked toward the higher end of smartwatches that would contain as many features as possible. At that time, one smartwatch fit that bill best – the LG Watch Sport. At the time of its release, the LG Watch Sport had everything a consumer would want in a smartwatch. 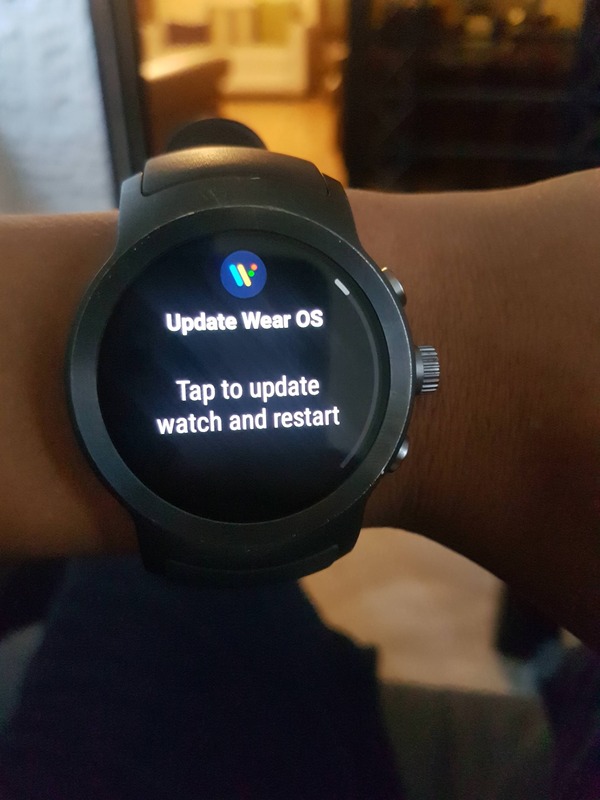 It came with Wear 2.0, the latest version of the operating system at that time. This watch has an IP68 dust/water resistance, the highest rating for any smartwatch. With a screen resolution of 480×480, no other watch can top this resolution. Other features include an ambient sensor for automatic screen brightness, LTE so it can have its own data without its paired phone nearby (requires another micro SIM card), NFC for Google Pay, three physical buttons for two extra shortcuts, a barometer, 768MB of RAM, and a wireless charging dock for elegant charging. Looking at the full spec sheet, you would think that this watch has it all; however, a perfect smartwatch has yet to exist, and this watch comes with some flaws. A glaring con revolves around its size. To pack all these features into the watch, it needs to have size, and the LG Watch Sport comes in at one of the biggest smartwatches out there. For a smartwatch with “sport” in the name, many active people need a lighter watch, and the LG Watch Sport’s bulk makes it cumbersome to wear during physical activity. Consumers also cannot customize the bands/straps. Many smartwatches allow the consumer to swap out the straps/bands for customization, but the LG Watch Sport’s straps/bands come affixed to the unit. The LG Watch Sport also comes with horrendous battery life, even after you disable a lot of the key features such as LTE and wrist gestures. However, this battery issue applies to most Android smartwatches (sans the Galaxy Watch, which does not run on Android Wear). Lastly, and the main reason I decided to get rid of this smartwatch, the dreaded LG screen curse applies to this gadget. In less than a year of daily usage, some off-colored lines appeared at the top of the screen. While it did not affect the performance of the device, one may see the noticeable lines as a nuisance. I posted about this in some online forums, and some suggested a factory reset, which I eventually performed. However, a factory reset did not resolve the screen lines. 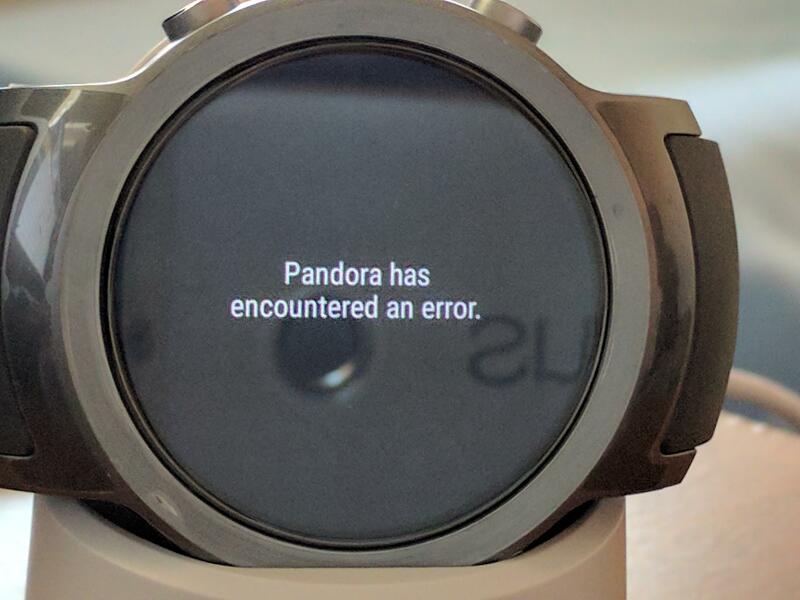 Some users also said they have this same issue not just with this watch, but with other LG devices too. Further research revealed that nearly all LG devices have this in common, that the screen may eventually end up with these lines in the screen. 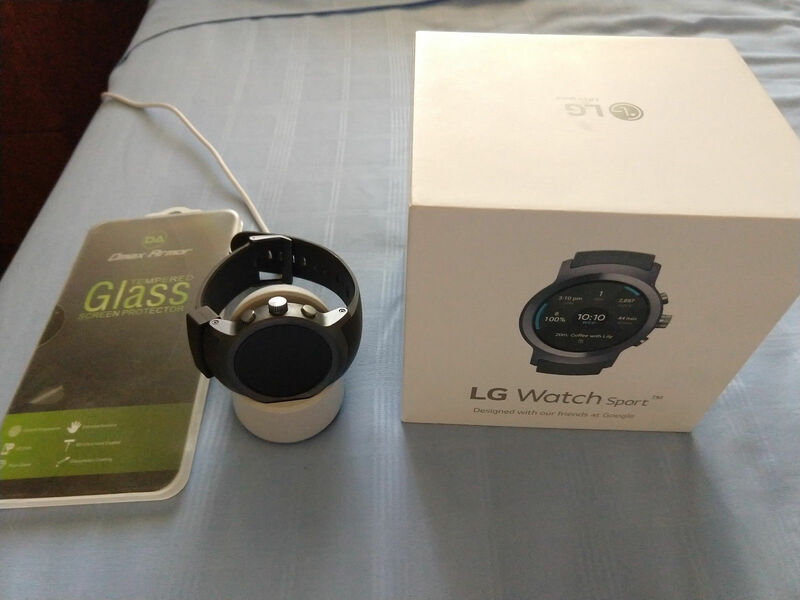 I contacted LG about a warranty repair, and I sent the watch to LG for repair. LG returned the watch to me a month later, claiming that they replaced the LCD screen (strange because this watch comes with an OLED screen). LG did send me back my original watch, as it had the same small nick on the exterior from before. Unfortunately, upon turning on the watch, the exact same lines in the screen remained. Basically, LG lied to me and simply sent me back my watch without doing a thing. After all of this, I decided to sell off the watch. Factors that made me decide to sell the watch included the screen lines issue, as well as all of the watch’s features that I never use. 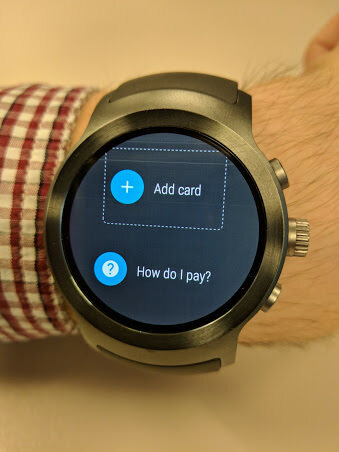 I paid for all these extra and premium features that I never used – I do not use the watch for Google Pay, I never traveled with my watch without my phone, and I did not like the bulkiness. From there, I decided that I want a more basic watch that simply shows time and has notifications. Sure I could have opted for a cheap <$5 watch from the nearest bargain store, but I still wanted an Android watch for notifications. Further research landed me at the TicWatch E, a basic and inexpensive watch but not as cheap as possible. The TicWatch E represents a great entry-level smartwatch easy on the wallet and with just enough features to introduce new consumers to the world of smartwatches. At less than half the price of the LG Watch Sport, I expected that this gadget would not carry as many features as the big guy. The TicWatch E has a lower resolution of 400×400, but weighs less than half of the LG Watch Sport’s body. 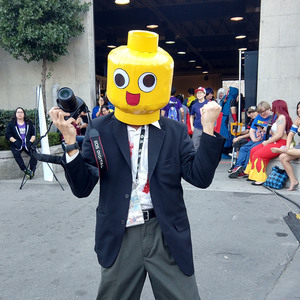 Such a light body does not feel so cumbersome to wear, and so far the watch’s frame feels more impervious to bumps and nicks – I lightly nicked the LG Watch Sport within the first month, and that left a noticeable impact on the exterior. Like the LG Watch Sport, the TicWatch E also has a heart-rate monitor, GPS (but needs its paired phone nearby), and a speaker. As for customization, the TicWatch E comes in three colors, as opposed to the LG Watch Sport’s two colors. In addition, you can swap out the TicWatch E’s bands/straps to place whatever you like, allowing for more customization. As a consumer moving from a higher-end smartwatch to an entry-level smartwatch, I expected to face a handful of downgrades. Most obvious, the watch does not respond as fast as the LG Watch Sport – it reacts slower to touches, and apps load slower. Of course, the TicWatch E has less RAM than the LG Watch Sport, among other internal specs. The TicWatch E has a lower water resistance level of IP67, which many regular consumers will not need to worry about. 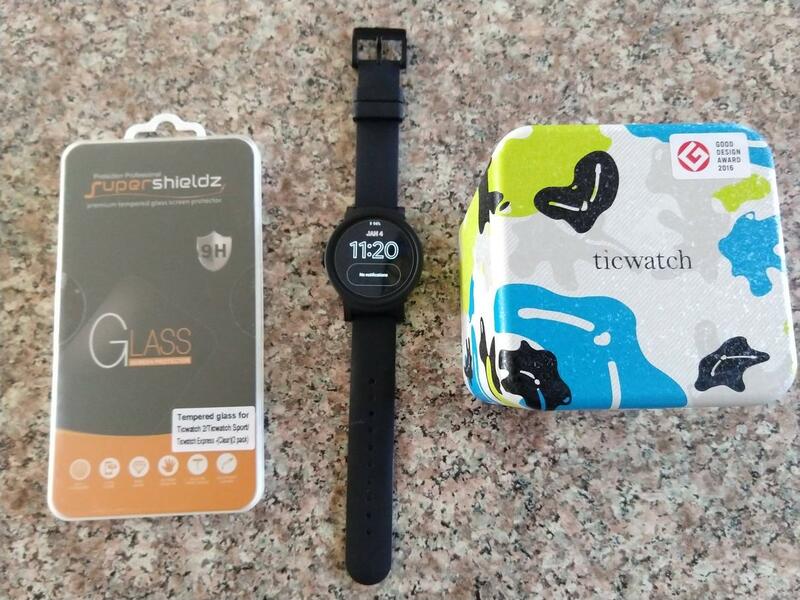 Other features that the TicWatch E lacks include ambient sensor for automatic brightness, extra buttons, LTE (so if you want to track a jog, you will need your phone with you), NFC (no Google Pay), and the charging dock (charges via cable just like cell phones, but you can buy a dock for <$15). Lastly, and this likely only applies to me so far, the watch face I used on the LG Watch Sport does not work on the TicWatch E – it keeps showing as invalid format. Despite the downgrade and loss of multiple features, I have no regrets about moving to an inexpensive smartwatch. The lighter body makes a world of difference in my daily usage. Ironically, the frame feels like it can take more physical hits than the LG Watch Sport – I have hit the watch on a few things already, and it still has no physical damage. I never used any of the extra features that the LG Watch Sport had, so I do not miss them at all. Really I only miss the charging dock that the LG Watch Sport came with, and that my old watch face does not work on the TicWatch E. In the end, the TicWatch E delivers exactly what I want out of a smartwatch at an affordable price. Anyone looking to get into smartwatches without splurging on models over $200 should look into getting a TicWatch E.